Patio furniture greatly enhances the visual appeal of your outdoor living space. If you are planning to decorate an outdoor deck or a small garden area, choosing the right patio furniture as per the size and theme of your patio would make your outdoor living space more inviting. Patio furniture also comes with accessories like Patio umbrellas and patio fire-pits to add comfort to you summer and winter outdoor soirees respectively. Besides this, you can also jazz up your patio with patio lamps, gazebos, garden benches hammocks, etc. to give your outdoor living space a complete look. Here are the examples of how celebrities have added glamour to their homes by embellishing their patio with the best outdoor furniture. Cher’s patio looks out of the world with the woven synthetic rattan outdoor furniture set. The Egyptian sculpture resting on the woven-reed table adds an extra charm along with the bronze oil lamps. The patio furniture and the accessories completely harmonize the heavenly view of the ocean. The cool ambiance of the patio beside the pool makes it a perfect venue for relaxing in the summer season. Mere words are not enough to describe the beautiful pool cabana of former American professional road racing cyclist, Lance Armstrong. Chairs and sofa with outdoor fabric, similar to Beliani’s outdoor conversation set Rimini perfectly suits the beautiful and comforting ambiance. The shades of the chairs and cushions along with the chandelier perfectly complement the color of the wall. Actor Gwyneth Paltrow has brilliantly decorated her private pool with the apt patio furniture. 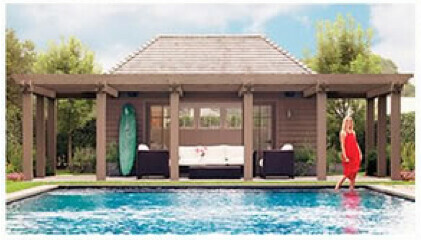 The outdoor sofa set beside the swimming pool perfectly matches the ambiance of this beautiful deck. The contemporary sofa and chairs are fashionable and finished in dark brown outdoor wicker, similar to Beliani’s contemporary outdoor sofa set Roma, to present a perfect balance between nature and civilization. You might not be able to afford these fancy pools, cabanas or huge backyards. But you too can lounge and dine like the stars in your garden and on your patio. Beliani makes sure you are getting the latest modern designs in outdoor furniture for your home at outlet prices.